March has been a month in flux for us at Sentimentalist Magazine. Quite a few of our main staffers had to jet off to various exotic destinations, (yours truly was transplanted last week to Austin, the month’s music capital of the world, for our annual up-to-the-minute SXSW coverage). In other words, those are a few reasons for the delay of this month’s letter and we apologize. Spring is in the air, and just like the crocuses in Central Park and the verdant buds on the trees around town, Sentimentalist Magazine online is growing fast. We really do appreciate your sticking with us and keeping up with our daily news, reviews and our monthly cover features. 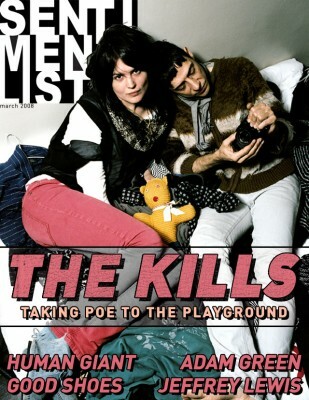 We hope you’ll feel more than a bit of lust in your hearts after reading this month’s cover story on The Kills. Or if it’s a goof you’re after, the feisty trio known as Human Giant made assistant editor Carrie Alison laugh ’til it hurt during her recent chat with them about their new season. They’ll do the same for you no doubt. Please read on and keep your comments coming. Thanks! When you think of The Kills, the words “pizza, pizza, daddio” don’t readily come to mind. Maybe they should. Maybe that’s the problem. I’m sitting in the Human Giant office in New York City on a couch strewn with winter coats, and below a poster of the Kate Hudson-Matthew McConaughey movie How to Lose a Guy in 10 Days. This is going to get a little crazy.